Iran’s radical, pugilistic President Mahmoud Ahmadinejad in a fiery sermon demanded that Iran’s enemies—meaning us in the West—bow down before Iran and apologize for having held back Tehran’s nuclear program for three years. Question: What did the West do that actually slowed Iran down? It seems to be the almost universal opinion that the world has been sitting on its hands while Iran has continued to develop its nuclear program. 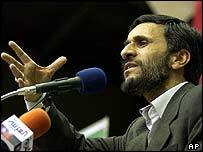 Ahmadinejad also warned the West that it would “burn” in the “fire of the nations’ fury.” “If you do not return to monotheism and worshipping god and refuse to accept justice then you will burn in the fire of the nations’ fury,” Ahmadinejad said. By “return to monotheism and worshipping god” he apparently means Allah, which of course implies that Ahmadinejad will release the wrath of Iran on the West if we do not soon convert to Islam. JihadWatch inteprets Ahmadinejad’s rantings as: "... the call to accept Islam that precedes jihad, in accord with the Muslim Prophet Muhammad's dictum to call the unbelievers first to accept Islam, and to fight them if they refuse (Sahih Muslim 4294)." Is Ahmadinejad issuing fair warning before he unleashes the Iranian hordes on us? Does he also intend to take on the rest of the non-Islamic peoples? Should the 4.3 billion of the world’s 6.6 billion people who are not Muslims start to worry? It is the hot season in Iran, and perhaps the heat is responsible for Ahmadinejad’s provocative rhetoric. The threat Iran poses is relatively small, unless and until it acquires nuclear weaponry. Ahmadinejad has to know that his military—which while not insignificant, is far from dominant—has no chance of taking over the world and either converting billions of people or killing the billions who refuse to convert, even in the unlikely event that he could unite the disparate factions of Islam behind him. And he has to know that even with the help of nuclear weapons he gets one shot before Iran is erased from the map. So what is Ahmadinejad up to? He can cause some mischief in the region, of course, and he can continue to support terrorist activities. But it is unlikely that Iran could take down an Israel military that, unlike in the conflict with Hezbollah where it tried to minimize civilian casualties, would fight the Iranians with both hands and feet. All things considered, Ahmadinejad’s rant is just a lot of hot air.